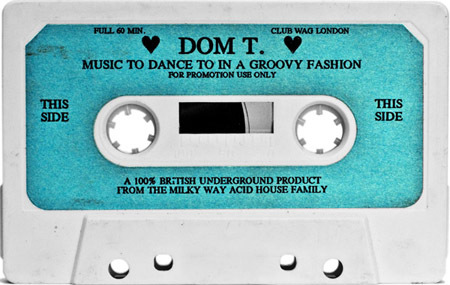 Dom T. came to Los Angeles via London’s Wag Club in 1990. 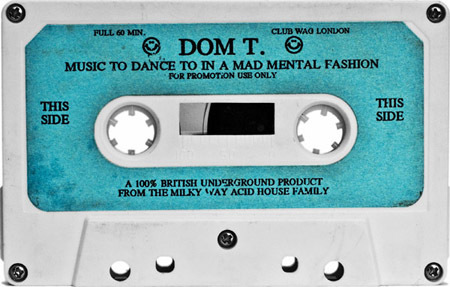 This mixtape was recorded in 1991 and released by The Milky Way Acid House Family. What’s that first track on Side A? I’ve always wanted to know what that cut is…anybody know? great timing and mixing skills i remember this guys name on alot of the old skool party fliers. Dom T was my fav dj at the Truth parties. We used to go to Max’s on Sundays,in the heart of Hollywood, after 5pm and THIS was the vibe we had to have before going to Sunday Love w/Doc. Great memories, thank you Simfonik! AND Josh! I Love You! Anyone have an ID on the last track on side A? Fire right there. TIA.